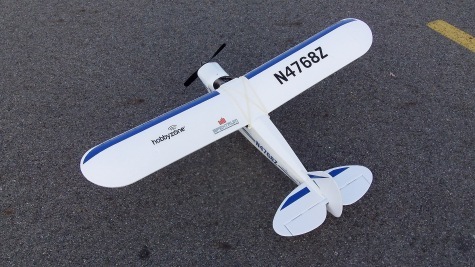 The Hobbyzone Super Cub DSM is basically a larger version of the Hobbyzone Champ. It's very beginner-friendly, featuring 3 channels (throttle, rudder, and elevator). It's not as responsive as the Champ, but that's mainly due to the increased size. 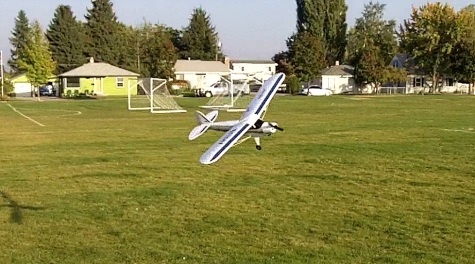 It takes 11.1V 3-cell Li-PO batteries, and has a standard spektrum DSM receiver. Some assembly is required! Unlike the Champ, the main wing is removable, held on with four rubber bands and plastic wing struts secured with screws. Attaching or removing the wing doesn't take too long, though. I usually choose to fly without the struts, just to save time during set-up. The battery bay is definitely too small. While the stock 1300mah battery fits snugly, other 3s lipos won't fit without modifying the bay. I used exacto knives to remove some of the foam in the back of the battery bay in order to fit longer/different-shaped lipos. I also had to cut out the back of the plastic battery cage. While removing foam and plastic will weaken that area of the plane, I'd say it is worth loosing a small amount of stength than to be stuck using the expensive stock batteries. Using the stock 1300mah 3s battery that is included, I generally get about 15 minutes of flight time when flying 1/4 - 1/2 throttle. If flying at or near full throttle for most of the flight, it will last around 10-12 minutes. I would recommend having 3 or 4 batteries, because who likes waiting 45 minutes for them to charge when you could be flying?? Do NOT buy stock batteries from hobbyzone! They are quite expensive and alternatives are better and cheaper. Check out HobbyKing.com for good deals on 3s lipos. 1000mah lipos should fit in the battery bay fine. For 1300mah batteries, cut out foam in the battery bay to make space and you should be fine (described above). I haven't tried batteries larger than 1300mah, but wouldn't recommend it because of the small battery bay.